At Manoa Elementary School, students headed back to class yesterday for the first day of the new school year. Before the start of school, families could eat breakfast together in the school cafeteria. Joseph Valoroso gave his 7-year-old daughter, Jolyn, a reassuring hug and talk before they went to her second-grade class. Valoroso said Jolyn's first-day-of-school jitters paled in comparison to the battle she fought with cancer. With tears flowing down her cheeks, Jolyn Valoroso barely touched her breakfast yesterday in the Manoa Elementary School cafeteria. Public charter schools first started on July 21 and will continue until Aug. 20. The 7-year-old clung to her father shortly before the school bell rang signifying the start of second grade. "As a dad you feel for them cause you want to comfort them and take care of them, of course," said Joseph Valoroso, Jolyn's father. "But I feel that once she gets started in the groove again she'll be fine." Jolyn was one of about 587 students who went back to school at Manoa Elementary yesterday. Most of Hawaii's 177,000 public school students statewide start classes this week. A former Manoa Elementary student himself, Valoroso said Jolyn's first-day-of-school jitters pale in comparison to the battle she fought with cancer. As a 3-year-old, Jolyn was diagnosed with acute lymphoblastic leukemia, a cancer that attacks infection-fighting cells. She has been off chemotherapy for two years. "She's a tough cookie," her father said. Holding tissues in her hand, the second-grader continued to cry in her new class of about 20 other children. Her teacher Lanelle Oshiro and school tutors were on hand to console Jolyn and other anxious students. "This age isn't too bad because they've already been with each other through kindergarten and first grade," explained Oshiro. Jolyn attended Manoa Elementary last year as well, but she was sad to be away from her parents. Oshiro understood the apprehension. Yesterday was her first day in second grade, too. She had taught third grade last year. At Manoa Elementary School yesterday, students headed back to class for the first day of the new school year. 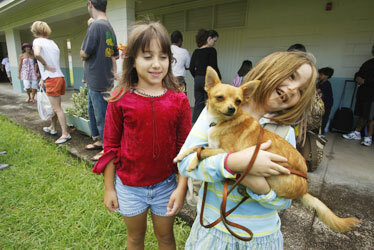 Talulah Skilling, 7, brought her pet dog, Rufus, with her to school. Her friend Sylvie Tereschuk, left, smiled as she watched. The second-grade teacher and other educators began planning for the new school year during the summer, arranging lesson plans and learning children's names. Two counselors and other staff members also helped students adjust. "It's been very smooth, so I'm very glad," said Jeanette Uyeda, Manoa Elementary School principal. "The parents are more anxious than the kids sometimes." Students in first through sixth grades were welcomed back at Manoa yesterday. Kindergarten classes start on Tuesday. Not everyone was uneasy about starting school. Many felt ready to learn, with new school supplies and apparel. Six-year-old Keissa Isono was happy to trot to her first-grade classroom in her new pink sneakers. "She's really excited. She didn't want to eat breakfast at home," said Keileen Isono. With her two daughters, Isono ate breakfast at school a few tables away from Jolyn and her father early in the morning. Later in the day, Jolyn finally started to smile while sitting in Oshiro's classroom. "Now I'm not crying anymore," she said, still red-eyed. After a lunch of Creole macaroni, Jolyn and other students ended their first day early at 1:30 p.m. Public schools will continue to open this week, with the last ones starting tomorrow.